A luxury corner masterpiece with amazing volume and light this property is destined to become one of the areas finest homes. A residential tour de force thanks to an abundance of amazing space and light, high end quality that focuses of premium fittings and finishes, and an enviable corner position, this unmissable and brand new 4 bedroom + study, 3.5 bathroom residence is an inspired masterpiece that rarely comes along. You'll be left breathless the second you step inside this dual level oasis, with the remarkable open space and relaxed natural light a striking first impression. Engineered French oak flooring, Arabesque marble and towering windows dominate the ground level, which has expansive lounge and dining zones separated by a gas stone fireplace. The kitchen is also a highlight of this area with full Miele appliances, integrated Siemens fridge and freezer, Vintec wine fridge, walk-in butler's pantry/kitchen and a wealth of storage major features. A huge home office is the perfect space for those running a business from the residence. Upstairs, a generous retreat makes the most of its corner position with this area ideal for afternoon relaxing and movie nights. 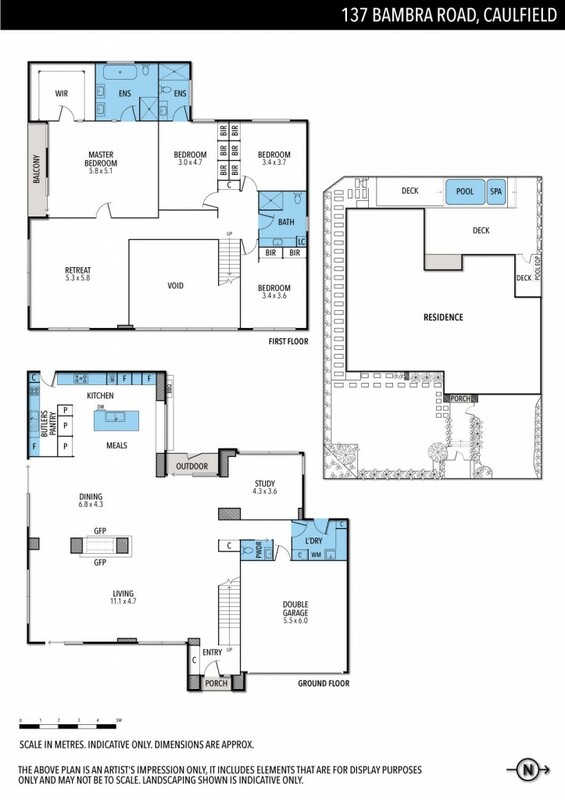 The top floor is also host to the four large bedrooms, with the incredible master bedroom showcasing more space than you'll know what to do with along with a private balcony, walk-in robe, and sublime dual vanity ensuite with elegant freestanding bath and a rain shower. There is a 2nd upstairs bedroom with an ensuite, while the two other bedrooms have easy access to the stylish main bathroom. Make the most of alfresco spaces all around this property with a large front garden plus an entertaining zone at the rear which includes a sizeable deck, built-in gas BBQ kitchen, and a pool and spa. Other property extras include a downstairs powder room, laundry (with chute from upstairs bathroom), ducted reverse cycle heating and cooling, ducted vacuum, garden irrigation system, internet camera security, video intercom, secure alarm, Sonos system, pre-wired for solar, and a double remote garage. Benefit from this Bambra Road location close to Caulfield Primary School, Melbourne Montessori School, Glen Eira College, Glen Huntly Road shops and restaurants, Caulfield Racecourse, Monash University, Booran Reserve, Princes Park, local buses, and Caulfield Station.